Also known as the Red Reef or Red Legged Hermit Crab, the Scarlet Reef Hermit Crab is named for its bright red legs, which are contrasted by their yellow face. Native to the reef faces and coral rubble of the Caribbean and Western Atlantic, these active scavengers can consume large amounts of animal matter and algae. Despite their large appetites and constant feeding habits, the Scarlet Reef only grows to an adult size of 1-1/2" in length. 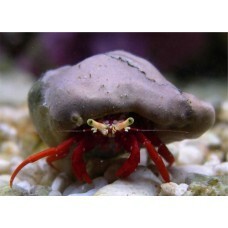 In the home aquarium, Paguristes cadenati is best kept in an established reef system with ample algae supplies. However, they will eat almost anything, including fish food and invertebrate diets. If algae levels are insufficient, supplement their diet with dried seaweed and other marine foods. Like other hermit crabs, an ample supply of empty shells should be available for the Scarlet Reef Hermit Crab to move into as they molt and grow. As with all invertebrates, they do not tolerate copper-based medications and extreme fluctuations in water parameters. Also, take special care to ensure an invertebrate-friendly environment free of predators.